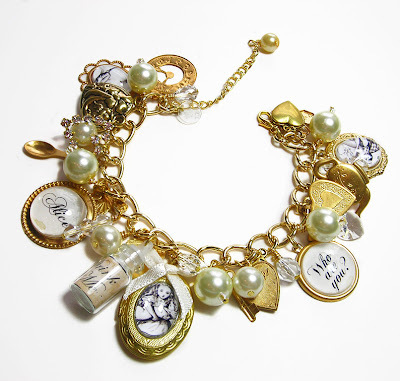 I wanted to make an Alice in wonderland charm bracelet that screamed class and glamour whilst also capturing the magic of the infamous story. I decided to cram this one with lots of gold charms and beautiful illustrated pictures from the novel, I complimented the gold chain and Alice charms with cream glass pearls and super sparkly swarovski crystals representing the 'diamonds'. Each piece has been lovingly hand attached to the chain, the centre piece comprising of a beautiful fully functioning locket adorned with a black and white illustration of Alice and the pig baby. I'm really pleased with the finished item of jewellery and feel this piece is definately a must for any Alice enthusiast! 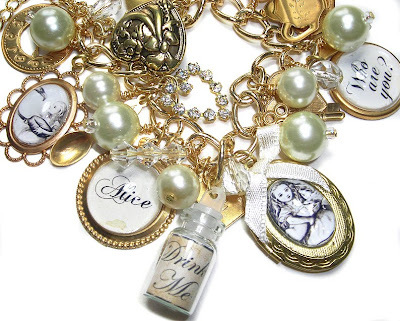 View other Alice in wonderland jewellery here! Wow, these pieces always look so good. I tried looking at your blog but I dont have access do you need to change the settings? Wow, I just love the bracelets but...how did you get the text etc in the charms? They look absolutely stunning. I make all my own charms using cut outs and covering them with plastic or glass clear cabochons, quite time consuming but great for making individual charms!